The first Saturday of May is a red-letter day for comic book fans because it’s Free Comic Book Day all over the world. While previously, the free comics were literally old books that were rehashed, in the past few years, quite a number of them have featured original material some of which is more than filler stories. And quite a few of these actually tie up in many of the regular storylines. Whether you’re an old-time fan or a newbie, here are some of the best comics that were given away for free this year. Grant Morrison will go down as one of the best comic book writers of all-time. This man’s mind is a mass of creativity and ingenuity. I for one can wait to read more about his stab at Indian mythology! His co-creator over at Graphic India, the legendary Stan Lee, released on FCBD 2015, Chakra the Invincible, his all-original Indian heroine. “Avatarex," written by Morrison with art by Jeevan Kang, is about an Indian superbeing who is awakened prematurely before a great war that will precede the end of days. As such, he has to deal with the mundane reality of life in modern India. A refreshing take on superheroes as it’s from a different culture. Four new stories and previews from Boom and Archaia (the latter was acquired by the former in 2013)! What makes this a must have is the new “Mouseguard" story by David Petersen. Previously, Mouseguard was given away in solo form albeit in hardcover format. “The Tale of Piper the Listener” about a journey to understand the languages of otters, birds, and other animals by the mouse Celanawe is a stand alone story that will no doubt be collected later on as they have with previous stories. I love Mouseguard for the depth of Petersen’s imagination and creativity where mice battle for survival in a medieval-like setting. The artwork is intricate and gorgeous making every book a treasure trove to own and read. The other stories here are previews of upcoming books such as "Adventure Time," "the Lumberjanes," and "Goldie Vance." While offering a more humorous if not cartoony bent, they are both fun, somewhat irreverent ("Adventure Time"), and perhaps more importantly, fun. Steve Rogers is back as Captain America again (for the nth time) and hopefully, we’ve had enough of these Steve-is-replaced/Steve-is-back storylines because this crappy gimmick really gets old. But this Cap looks like Bryan Hitch’s Cap from "The Ultimates" and Hydra resembles ISIS. Just wondering though why Sharon Carter, now head of SHIELD, looks old. Weird. There’s a second storyline, “Dead No More” that is supposedly going to rock Spider-Man’s world. And these pages that show the Rhino and Gwen Stacy alive once more! What gives! What a cliffhanger. “The Minority Report” — Marvel style. Stopping a crime or something evil before it actually happens. Always an intriguing point of debate. Not sure why we need another dust up between heroes especially after what happened the last time. While I am not enamored of Brian Michael Bendis’ penchant for destruction from within, it bears watching. One of the biggest indie comics of the 1980s will have new stories this coming July! For a modern audience that is largely unfamiliar with the genius of the Hernandez brothers. "Love and Rockets," are different stories, each penned and drawn by Gilbert and Jaime Hernandez, about the lives, trials and tribulations, and loves of a different cast of characters. “Love and Rockets" is why I enjoyed “Strangers in Paradise” and Craig Thompson’s works ("Habibi" and "Blankets”) and other similar stories. This freebie features classic works to get the a new audience acclimated to lives and loves of this incredible comic book soap opera. I so sought this! After I read “You’re All Just Jealous of My Jet Pack” from Scottish creator Tom Gauld, I had to get this. This is a preview of an upcoming graphic novel from Drawn and Quarterly about a cop on the moon! In this preview, he helps locate a missing dog on the moon. It’s absurd but absolutely fun and intriguing. The Space Knight returns. Rom was published by Marvel Comics in the 1980s and was about a cosmic hero who chased after aliens who infiltrated the earth. Now, under IDW’s banner, the character is rebooted for a modern audience. While the reboot offers nothing different or even something to knock your socks off, it is still worth watching or checking out where they are taking this classic character. 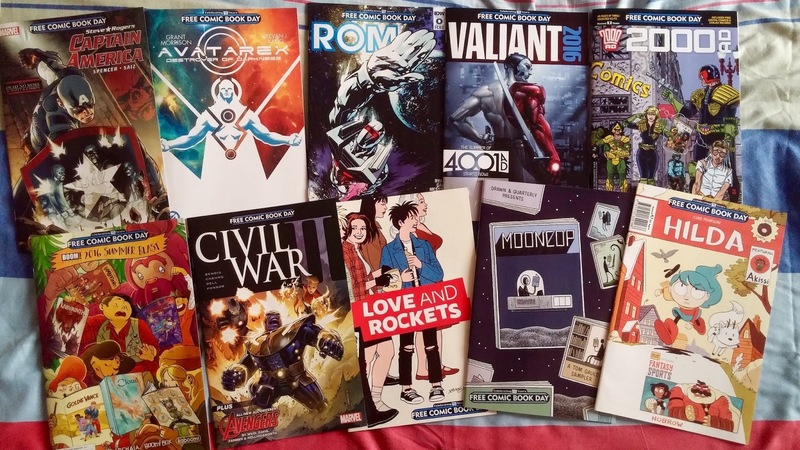 Valiant presents their universe in the 41st century; a prelude to their summer comic event. Five stories featuring Rai, Divinity, Archer and Armstrong, Faith, and Bloodshot. Very promising and exciting. This is the meatiest of all the free comics! Forty-eight pages! Features a slapstick jab at Captain America vs Superman featuring Judge Dredd. There’s a feature about a job involving murder, galactic frontiersman Ajax Bloodthirsty, Nemesis the Warlock and more craziness from the company that pushes the morbid and brutal.